That's scary, I've actually never seen a gun. And folks are suppose to believe this is a true statement? Let me fix this decided life deficiency for ya.........., which BTW I sincerely doubt was a truthful statement to begin with given all the cop shows and movies which contain them - here's just a few of mine for you to "see". I'm pretty sure he meant actually in front of him (In the flesh so to speak). I work with guns and weapons regularly, pistols and assault rifles and am qualed up on several... I would never have one in my house, there's no need and if anything it simply increases your chance of being robbed as now there's something more than a TV and a couple of laptops to steal. It depends on your interpretation of of "seeing". If I post a picture of the Eiffel Tower or Taj Mahal, I wouldn't say I'd seen them if you know what I mean. For countries where gun control is pretty strict, a gun become suitably rare to where it falls into a same kinda category. If a gun is commonplace to another person, they probably wouldn't make the same connection there. Only time I'd say I'd ever seen a gun would be when I was in Norway a few years ago (polar bear defense - German WWII bolt action rifle I think) and more recently when I've been at airports or in places with armed police. Obviously, I've seen a lot of movies, TV shows and played countless shooty videogames. So I guess that, probably, pokerman had seen a gun, but hadn't seen a gun. Yeah I would assume physically seeing rather than a photo is what he meant. I've only ever seen one a handful of times and all were in the arms of authority figures, I'd be happy not to see another one in future tbf. I guess that would be the premise of the OP too apparently, since he put "see" into the quotation marks. Well, it was just the opportunity to impress folks with his weaponry, which is perhaps the main reason to have it in the first place anyway. Why the aggression in your post F1nut? It's pretty clear pokerman meant in the flesh but even assuming he didn't it's strange how much that statement seems to have annoyed you. I'm pretty sure OP knows it too, but he took it as a chance to show off his weapon collection. 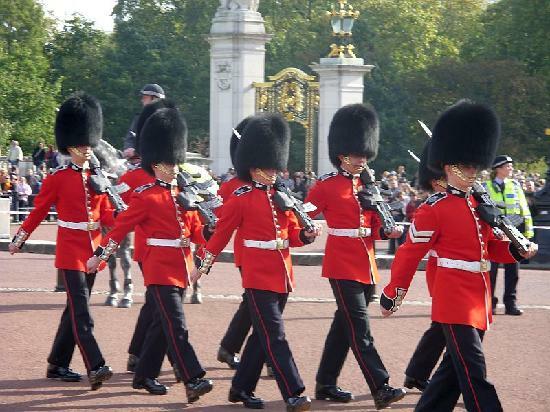 Well I imagine a lot of British people haven't seen the queen's guard in the flesh. Last edited by F1nut on Thu May 25, 2017 7:30 pm, edited 1 time in total. Help for the beleaguered nation came from both the American government and from the American people, (Texans included) the latter through the "American Committee for Defense of British Homes." In late 1940, the committee sent an urgent appeal -- which, of course, appeared in NRA magazine, the American Rifleman, of which I'm a Benefactor/Life member and still receive to this day) -- for Americans to send "Pistols - Rifles - Revolvers - Shotguns - Binoculars" because "British civilians, faced with the threat of invasion, desperately need arms for the defense of their homes." Thousands of arms were collected and sent to England, one of which was a .30-'06 Model 1903 target rifle owned by Major John W. Hession. Hession was one of the pre-eminent highpower rifle target shooters of his day, and he used that rifle to win Olympic gold at Bisley Camp in England in 1908. The rifle, unlike the majority sent and subsequently destroyed by the British government, was returned and can now be viewed in the national Firearms Museum. I'm guessing you voted for Trump too? Wow. You really got riled up by a simple statement. I bet lots of people in the UK have never seen a gun in person. Seems the reason for this thread is just to outright bash pokerman? You say you're only aggressive when provoked, I think this thread proves otherwise. I'm not affraid of guns, actually I'm affraid of people carrying guns. Your argumentation can be turned around and used to explain how grown men have become so excited about guns that actually love them and create assotiations about them. You make excellent points, over 50 years ago civilians would have stood a far better chance against the highly trained military invading them if they had access to guns. On the other hand, here in 2017, schoolchildren being gunned down by assault rifles isn't a regular occurrence. So you know, swings and roundabouts. Ok, now you have bragged enough about your great weaponry collection, your great own self, your great Texasland and your great ancestors... any other? I live in UK, and used to go shooting at the range with my friends, mostly every Monday morning. The government then passed a law that more or less outlawed it, even thought we were all licences, so myself and my friends surrendered our guns and left it go. This was in response to a newspaper drive to "take the guns off the streets". Yeh, that worked. Tbh, people who know guns are usually far more sensible about it as they understand what a gun will and will not do. For instance, it would have taken several people with several guns each to cause the carnage we saw the week end. Those of us who served in the military became familiar with guns on a day to day basis and understand them. I have no fear of seeing armed police, although I disagree with it, what bothers me is someone who buys a gun on the street, having never trained or even test fired one. They are more likely to shoot the wrong person or several rather than just the intended target. You might be correct that Britain is a disarmed nation, but why do you describe that as "sadly"? There were more deaths from from guns in the USA in any one year, than the total that there have been in the UK, ever. Why is that a source of sadness to you? The right to bear arms is both misconstrued and redundant in today's society. The real quote is that citizens "have the right to bear arms as part of an organised militia". It doesn't at all state 'y'all can have some guns in your home coz murica!' It simply allows people to arm themselves as part of an organised civilian militia against the government if it were to become tyrannical. Secondly it is absolutely redundant with modern technology. Back in the day it was written the state of the art military weapon was single shot breach loading rifles and muskets, something that every farmer would likely own for pest control and protection of themselves and stock against predators. If an uprising occurred the government and the populace would be identically armed and the populace would outnumber the government to such an extent that there was no point in them resisting. That's not the case any more. I've never seen a farmer eradicating pigs using an A-10. I've never seen a group of civilians quickly redeploy am entire armoured battalion across the nation in 24 hours by a fleet of C-17s. It's not an equal fight any more. No amount of untrained, yet enthusiastic, gun owners are going to go toe to toe with the single most destructive force created by human kind in all of history. That, plus that the present day US army would be but their own kids that to raise their stupid arms against. The entire premise of that 2nd is outdated and so absurd in this modern day of both social and technological arrangements that is beyond me that so many folks there over in the US still buy into it and keep parroting it as their holy Bible. The actual meaning today is rather simple one: commercial. It generates huge revenues to the industry, never mind some 12,000+ a year fatal casualties due to fire arms. All what it can potentially end into would be some form of a crazy civil war such as "libtards" shooting "Trumptards" and vice versa. And the feds shooting 'em all. The "philosophy" behind the 2 century old 2nd goes hand in hand with "sovereign citizens" folks who take up to the medieval Common Law of the right to a free travel upon land, and hence no traffic laws, regulations or codes apply on them since they are not "driving" their vehicles in a commerce but just freely "travelling". You can - and many do - certainly read that as saying that guns are only for the militia, but it's not what the amendment actually says. This, however, is completely true. Anyone who believes they and their AR-15 are a 'check' on the potentially tyrannical government is seriously deluding themselves. At its core - and this is my opinion - the idea that a citizen has a right to carry a firearm in public and defend themselves with it is anarchistic and anti-civilization. It's an idea that you should be responsible for your own defense, not relying on a government and its tools to protect you. No good, and a great deal of harm, comes of citizens being armed in public. The argument that armed citizens stop crime has been debunked, whereas the argument that the proliferation of guns helps criminals is supported by every fact there is. In the USA, anyone who wants to commit a gun crime can. That's what our second amendment freedom amounts to. I personally am interested in archaic weaponry, and own several sharp and battle ready swords. Would I oppose them being taken away? Certainly. Do I think I have any right to go out in public wearing one? Certainly not! The desire to carry guns in public is selfish, narcissistic, and antisocial. It has no place in any sort of first-world country. English not being my first language, I wonder how this sentence can be interpreted any other way but that the second, auxiliary part of it is referring to the first part. If there was a conjunction "and" in between instead of the determined article "the", then yes. This statement does not stipulate any other reason/justification for the people/citizens keeping and bearing arms but for the one spelled out there: "a well regulated militia". Maybe for the sake of robbing people on the roads? Well, one can "read" that one in to it too, just as same as "for personal protection". Neither is there. What is interesting to me is to see the die-hard proponents of the 2nd sticking to it literally as it is, as it would be typical for religious quotes. You take it all in its entirety, or if you acknowledge that one part of it does not make a sense then it may bring in the question the other parts too and eventually invalidate the whole thing. Hence, what the hack, they need they assault rifles in order to keep their government in check as a well regulated militia, just as the Holy Amendment states it so. Never mind it being pretty much a crazy concept otherwise. Why would a community that requires arming be preferable to one that doesn't? If anything else carrying a gun around everywhere would be an inconvenience. Just one more thing to remember before I leave the house. The gun culture in this country is out of control and powerful due in large part to the abnormally high influence of the National Rifle Association in politics. There is a LOT of money behind that organization. In my opinion, no where in this country is the gun culture more out of control and asinine than in the state of Texas, however, that could be a thread of its own! And yes, there are still those in this country who claim that it is the "guns in the home" that is the reason that this country has never been invaded by a major power... even some relatively intelligent people amazingly. Not every American feels the need to have a gun, or as we see here, an arsenal, in their home... thank God. There is probably a bigger percentage of Americans (US Americans) wanting better gun control than the other way around, but the anti-gun faction is not as organized, therefore not as rich and powerful. Well, I have had my say, and am going to move on before my blood pressure readings get too high. I can pretty much guarantee that this thread will not end well. 2. many of gun people wouldn't mind the inconvenience... it makes them feel tough. Don't buy their "it makes me safe" argument for a minute! The first part of establishes the reason why the second part is necessary. If they saw no reason for there to be a militia they wouldn't have bothered having an amendment that stipulates that the citizenry's "right to keep and bear arms shall be infringed." If that were the case that would've been the what the stanza started with, or might've been all that there was written on the matter. I agree with both you and Blackhander on the other points. Last edited by RaggedMan on Fri May 26, 2017 12:26 pm, edited 1 time in total. The whole "good guy with a gun" making everyone safer argument is ignorant beyond belief. More people are killed and injured by their own weapons or weapons in friends/relatives homes than from street crime. And the idea "good guys" (who aren't law enforcement) whipping out their guns when a store/bank/bar they're at gets robbed and only shooting only the "bad guys" is ridiculous. If there's more than one "good guy" there's no guarantee that they won't end up shooting at each other because all they know is the place is being robbed and there's somebody I don't know with a gun so I need to protect myself. I shot some guns for the first time in my life around a year ago. I loved it. Absolutely loved it. Being Scottish, they're not readily available and I was really hesitant at first but once I got going at the shooting range (in Prague), man... it was an amazing feeling and so much fun. What I can't stand, is people who create arguments and false facts to try to defend their opinion. If someone believes it is their right to own a gun just because it is then fair enough, but it frustrates the life out of me when they start using incredibly stupid logic to defend it. People are not safer with everyone armed, the data backs this up. People are not equipped to overthrow the government, otherwise they'd need some nukes and fighter jets (why don't you have the right to buy those too?). If someone says its fun, its part of my culture and I accept there is a fall out I'd fully accept that although I'd disagree. That which is cultural is not amicable to reason. I'd hate a speed limiter on cars although I know it would save lives. I'd hate fully pedestrianised city centres although I know it would save lives. I'm not going to try and twist together an argument showing that allowing cars to go 120mph actually makes things safer. I just asked a relative who is a police officer what her views on being armed were. The replay was. A criminal has a gun or knife etc, and is apprehended. They wave the weapon in a threatening manner but the copper still has the opportunity to talk to them, and innocent bystanders by and large are not harmed. Worst case, the bad guy gets away and the cop has seen them. Same situation and the cop has a gun, someone is liable to get shot. Most likely either the good guy, unless they are in the habit of shooting first, which is a real bad thing, or equally likely a bystander gets involved as a shield/hostage etc. There is also the mental link of cops have guns, I need one incase I get caught. An article some of you may find interesting. As for the 2nd amendment yes we have the right to bear arms and the intent for this was to over throw the government way back when. But fast forward to present day, your bringing guns to a drone fight. Good luck, your not gonna overthrow a damn thing. Arguments can easily be made for both pros and cons of this. But yes more often then not the general public make foolish statements with minimal facts to back up there claim as to why they wanna be a gun owner. More training should come with being licensed. You fill out some paper work, wait for processing and a back round check. Boom your licensed and can go purchase whatever your heart desires. Now the training is all on you if you so choose to do so. Now if you wanna conceal carry you have to take a ccw course which can be a 1-2 day class depending on your state. Meanwhile just about every single gun safety course, conceal carry class ive ever taken part of tell you DONT BE A HERO! Just because you happen to armed leave it to the professionals. (Meaning if your fav store is getting held up and your there let it go. your either gonna be mistaken for a bad guy or your gonna end up hurting someone you didn't intend on.) Like the expression goes " you only find hero's in the deli and the cemetery"
Home defense situation, its your house do as you wish thats my .02 on that. Warning - For you kiddies out there, bit of blue language contained in these videos. F1nut... if that's just a few of the guns you own, then all I can say is thank God your there & I'm here. Why in hell do you need that many guns and those types of guns ? If you honestly think they're going to stop a tyrannical Government from driving an Abrams tank through your front door, or firing a missile from a Predator Drone through your back window or dropping a MOAB at the end of your street, then you my friend are sadly mistaken. I was just going to link the Jim jefferies video as well. It's a sad state of affairs when one lone alcoholic borderline autistic Australian comedian can make better arguments in 10 minutes than the entire behemoth that is the NRA has ever came close too in its entire existence. That video is spot on. And believe me there are plenty of Americans who feel the same way. As I've said either earlier in this thread or in the Indy 500 thread, I've been around and owned guns all of my life and served in the military but have never felt the need to carry a gun on me at all times nor to make sure that there's always loaded gun in the house when I'm home. As I'm typing this I have 2 guns within 10 feet of me, one six-gun style revolver and a rifle. The ammo for them is in a different room and neither is loaded. His point about it being fun was right. When I was in the Corps I fired everything from .45 cal pistols to M16's to .50 cal heavy machine guns and it's a real rush. However I don't see any reason for it to be legal for me to own high capacity, high rate of fire weapons. There's absolutely no excuse to be made there. The one thing I'll add is that fighting back against the government wasn't the only consideration. The other was that having a armed and ready militia system also allowed a young and very broke country to not have to keep up and pay a standing full time army. It was a civic duty for men of military age to regularly drill with their local militias at the time. Sadly??? I wouldn't change it for the world. A quick glance at gun crime and homicide statistics here in the UK compared to the US makes a compelling argument. And an armed civilian population would have done little to help us against the 1940 Nazi invasion unless they were armed with aeroplanes. Yes I 'fear' the mere sight of a firearm. Its only function is to kill and thus I believe it has no place being in the hands of a civilian who is not trained to use it appropriately. Particularly one who believes that 'foreigners need saving from their own pacifist nature'. In a bizarre twist of fate I think you'll find that the first draft of the second amendment actually read "A well regulated militia being necessary to the security of a free state, the right of the people to bear Vickers QF 3.7 inch mkVI anti aircraft artillery shall not be infringed" but was toned down at the last minute. I have seen & used but don't own any firearms, I have gone hunting (rabbits, foxes & deer) and personally I think it's an experience most people should undertake to get a greater appreciation for their food. I do not however believe that people should be allowed to own guns, except those who actually have a valid reason for owning a firearm (like farmers). I do not think guns are evil, if you do then you should also think that bows are equally evil, I do believe however that people are incredibly stupid and I don't want to be thrown in with the same boat of people who want to own a gun because "It's for my family's protection", "to stand up to a tyrannical government" or because "it's cool" as that is just a load of crap.